Do you suffer, or know someone who suffers, from pain? Of course, you do. We all know someone who deals with pain regularly. Pain can be very confusing, not just for the individual, but for the person treating it as well. If you, or someone you know, suffers from pain which is increased or decreased with movement or positional changes then this article is for you. This article is written by Dr. Derek Nielsen of Kaizen Physical Therapy in Durham, NC. Click here to schedule a free visit! Does the pain get better or worse with sitting, lying down, walking, bending forward, twisting, squatting, or any other positional changes? If you answered “yes” to this, then keep reading. If you answered “no”, then you should immediately reach out to your physician as this can be a sign of a more serious problem. Was there an exact moment in time that you can point to which preceded the pain? Was there a fall? An accident? A popping or clicking noise? If you answered “yes”, then you should see your physician. If you answered “no,” then this article is for you. You have pain which is better with certain movement and worse with others. You also can’t point to an exact moment in time which caused the pain. 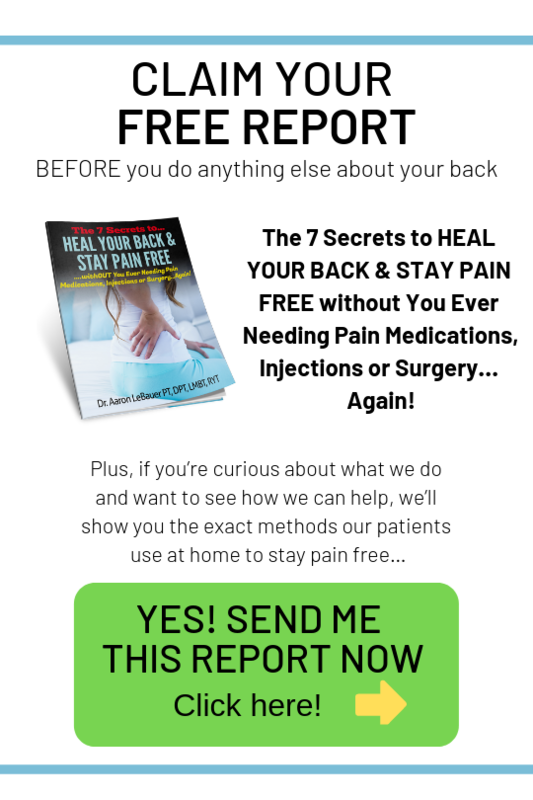 This is the person who I see in my clinic the most and the rest of the article will talk about why there is pain and exactly what to do about it. The human body almost never moves at a single joint by itself. Throughout the day, almost all movement requires multiple areas of the body working together to achieve the same movement. For example, let’s pretend that a person has lower back pain with a squat. In order to squat we require ankle, knee, hip, and back mobility. There is also some stability which is necessary. The person who doesn’t move well at their ankles will require more work from their back to perform a squat. The person who doesn’t move well at their hips will require more work at their back to perform a squat. The person who doesn’t move well at their back will require more work at their ankles and hips. You see, the body trades one areas work for another. But this is usually only sustainable for so long before pain ensues at some point. The question is, what usually becomes painful? The area of pain is usually hurting because it is overused. We see this when we sit for too long and our lower backs start to ache. Or when we look down at our phone for too long and the neck starts to ache. The aching sensation isn’t because there is damage. It’s because the area is being overused and is unsustainable. This is also the case in the squatting example. What area is having to work harder because another area isn’t doing its job? That’s the question for reaching a long-term solution to pain. Let’s say we have two guys moving 100-pound kettlebells from one side of the gym to the other. Together they have to perform this 300 times. However, one guy does this 250 times while the other only does it 50 times. Who do you think is going to wake up sore and hurting the next morning? Well, the body is no different. The area which has to do more of the work is the area which becomes painful. The solution is getting both guys moving the kettlebells equally, not just treating the pain. Squatting is just an example. Movement is movement, though. The body rarely moves at one joint, or area, without requiring other areas to participate with it. Walking, running, twisting, or even getting up from a chair is similar in that they require multiple areas working together to complete a task. Finding the area of the body within the task which isn’t participating like it should is often the golden ticket to long-term pain relief. Many of my patients are diagnosed with arthritis, degenerative disc disease, herniated discs, meniscus tears, and even muscle tears. They are told this is the reason why they are in pain. However, if there is no exact instance which you can point to when the pain started then the likelihood of these being the cause of pain are slim. Just like wrinkles on the skin, our bodies get wrinkles on the inside. These wrinkles come in the form of ‘scary’ diagnoses such as the ones listed above. The body breaks down as we age. Plain and simple. Bones aren’t going to stay perfect, muscles can tear, discs can herniate. This is normal. Many scientific studies have shown people with no pain have the same diagnoses as those with pain. Read that last sentence again. When it comes down to it, we humans move. The far majority have movements that are more painful and movements that are less painful. The solution is to really dive into what movements are painful and find out exactly what areas of the body aren’t moving and working like they should, regardless of where the pain is coming from. Because, again, pain is often due to the area being overworked. Treating the painful area is a short-term solution. Treating the entire body is the long-term solution. In the end, healthcare needs to teach people how to care for themselves, not rely on the system to take care of them. Pain meds, injections, and surgery are all interventions which are passive. They ask nothing from the patient. Healthcare should always have the goal of teaching life skills. Learning to help yourself should always be the goal. If you live in the Durham area and would like to come in for a free visit to see if I can help you find a long-term solution to pain, click here!